Growing up, Sid’s early musical influences were gospel and church hymns but as he leaned toward secular music, he got to know Hank Williams and Patsy Cline, and the popular music of the fifties by listening at night on a crystal radio under the blankets. Woody Guthrie became a big influence, along with Rambling Jack, Cisco Huston, all those cowboy songs and the stories that shine out from the past. Then Bob Dylan changed everything. It seemed like lyrics had a purpose and his passion for song writing had a place in the modern world. During all of it, Dakota Sid continued to master and hone his songwriting craft. His son Travers, born in 1977, the year Sid cut his first record, took to the music at a young age and has been playing and singing with his Dad, and many other musical endeavors ever since. He has helped shape, refine and co-write many of Sid’s songs and brings a youthful credibility to their presentation. 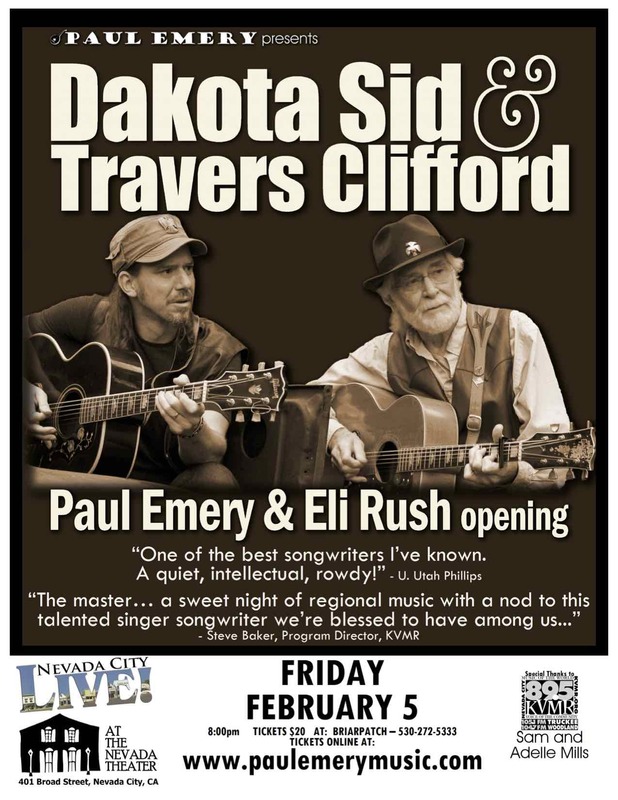 Together Sid and Travers present songs filled with historical accuracy, weaving together the reality of the human condition and the playful whimsy of the poet’s heart. The phrasing is simple and sparse, his socially conscious similes sparkle with imagery evoking crystalline images of American life.